Investing in a good wool mattress Topper is one of the best things to do when it comes to creating the perfect softness. A Wool mattress Topper is made of a blend of organic and chemical free wool.A wool mattress Topper offers several beneficial factors that ensure not only an uninterrupted, comfortable sleep but also a healthy environment. If you are planning to buy a 2” or a 3” thick wool mattress Topper, then The East Coast Organic Mattress Store is the best place to buy it from. Right from organic pillows to mattress toppers, every product at The East Coast Organic Mattresses Store is made using the highest quality ingredients available. 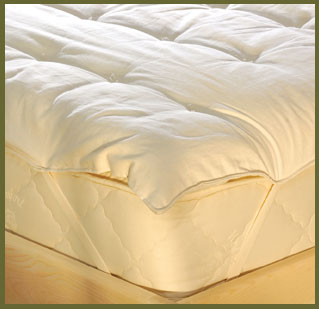 Scroll down to view some of the benefits of using a wool mattress Topper. These wool mattresses are made with wool materials that are completely organic and chemical free, which is good for its sustainability for years. Apart from this, there is less accumulation of dirt and debris, which keeps the bad elements away from your bedroom providing healthy air to breathe. Also, they require less maintenance, so you don’t have to do much in keeping it clean. What else you need in a mattress Topper with wool being a bad conductor of fire, you do not have to worry about any mishaps with the wool mattress Topper. Although, we suggest the Toppers are kept away from direct heat and other general precautions related to fire are taken care of. Apart from offering the softest touch, our wool mattress Toppers are perfect for individuals with allergies to microbes and dust. These mattress pads are made with utmost care and are absolutely hypoallergenic, which makes them suitable for most of the skin types with exceptions to some extremely critical cases where extra caution might be required. We believe in providing the best to our customers, that’s why our every product is manufactured with utmost care considering every step right from fetching the material to the end product. To get the best deal, stay connected with us to know more. Browse through our collection to get a comprehensive idea of what suits you the best.